The time has come to reflect and review… this year has been all about home for me… and so many things in my life to be grateful for – my daughter, my family, my home, my friendships… in 2018 it became clear to me that abundance is all around and doesn’t necessarily equal everything working out perfectly. 2018 had some great moments – The Taste Festival in Lublin, the supper club at You Don’t Bring Me Flowers… many moments of joy with my daughter and many new recipes and foodie ideas… I’ve been experimenting with different flavours of the classic Polish dumpling: pierogi. 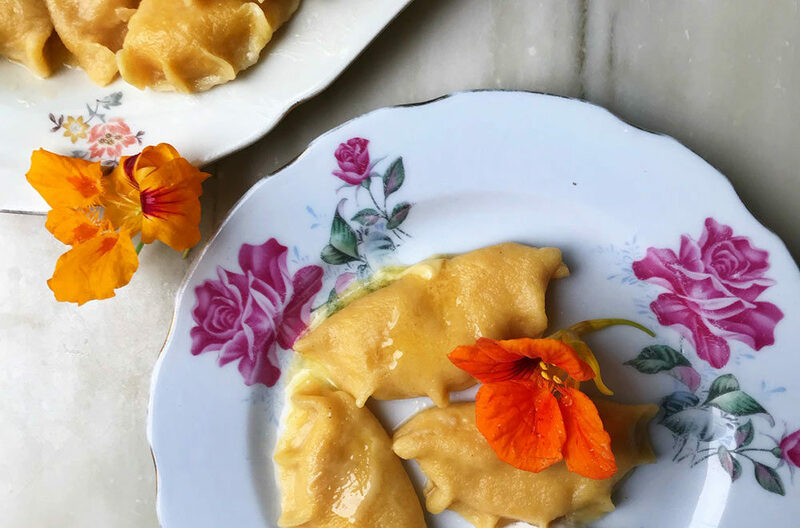 If you’ve read my cookbook, then you will already know my pink and green pierogi, yet these autumnal pumpkin flavoured ones are one of my best discoveries yet and ideal comfort food for this time of year. 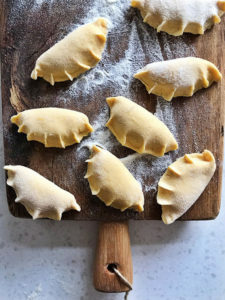 Yes, the chocolate and poppy-seed pierogi were amazing, but for Autumn the spiced pumpkin pierogi have stolen the show. To make the pumpkin purée, you simply cook the pumpkin in some water until soft, then blend it. To make the dough combine the flour with the egg yolks and add the pumpkin purée. Bring together with your hands, adding tepid water if needed. Knead for about 7-8min until you get an elastic dough, then add the oil and carry on for another 2 min of so. Cover with a damp tea-towel and place to rest in the fridge for about 20min. Meanwhile, make your filling by combining all the filling ingredients and mashing with a fork. Roll your dough out thinly on a floured surface. Cut circle shapes out of your dough and place a teaspoon of filling in the middle of each shape. Bring the edges together and stick to form half-moon shapes. You can also pinch the dough together afterwards to make the frills as they are in the photo. Cook the pierogi 5-6 at a time. Once they float give them another 2min, then remove with a slotted spoon. Serve with soured cream and honey (and nasturtium flowers if you can still find them). Making pierogi is always a time consuming task, don’t so this when you are in a hurry therefore. It’s always best to put aside a couple of hours, make more and freeze them. If you have time, then the whole process can be quite therapeutic.